Western Reserve Land Conservancy, which has preserved nearly 23,000 acres in northern Ohio, plans to move its headquarters to a parcel adjacent to one of the preserves it helped to create in Moreland Hills. The Land Conservancy plans to relocate to a 22-acre parcel on the west side of Chagrin River Road, opposite the Cleveland Metroparks’ Polo Fields, by making an addition to the historic main home on the property, according to Rich Cochran, president and CEO of the Land Conservancy. The home, one of three buildings on the property, was originally a one-room schoolhouse built in the 1830s. 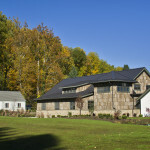 The property is adjacent to and surrounded by the village’s signature park, Forest Ridge Preserve. Cochran said the Chagrin River Road property will be fully integrated with Forest Ridge Preserve and the land added to the park, bringing the total area to about 140 acres. “This project will reflect our conservation values and those of our partners – respect for the land, its history and our precious natural resources,” said Cochran, who added that the planned project will also include proven and cost-effective green building technologies. He said the site will be changed only in ways that will improve its environmental impacts. It is likely to be Cuyahoga County’s first LEED Platinum building (the highest level of certified energy efficient design). The plans were unveiled Monday before the Moreland Hills Planning Commission. The Land Conservancy plans to use two of the three buildings on the site for its operations. The entire property will be used to engage in conservation education and passive recreation, such as trail walking and birding. The third existing building will be transferred to Moreland Hills. 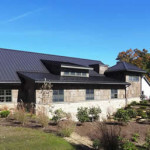 Cochran said the Lang family, a multi-generational Moreland Hills family with a long history of land conservation leadership, in addition to an anonymous donor, made the project possible. The Langs formerly owned the property, and they helped to create Forest Ridge Preserve a few years ago. Ken Lang, deceased, served as a trustee of the Land Conservancy in the early 1990s. Charles Lang volunteered for the group for many years. The Land Conservancy is very grateful for the family’s generosity and support. An anonymous donor is making a very large gift to fund the project, according to Cochran. The donor made an unsolicited offer to fund a home for the Land Conservancy several years ago, but did not identify a suitable property until the former Lang estate was located. The donor is also helping to design the project, and is passionate about making this a world-class facility and preserve. The Land Conservancy, which was formed in 2006 by the merger of eight local land trusts, has preserved more than 350 properties and nearly 23,000 acres in northern Ohio. The organization works with park systems, farmers and other property owners to permanently protect land with conservation easements, which are voluntary legal agreements that restrict future development. In November, Moreland Hills voters overwhelmingly approved Issue 88, a zoning referendum that permits certain entities, including nonprofits dedicated to open space preservation, conditional use of land to build facilities and to operate educational and recreational activities. The approval paved the way for the Land Conservancy to seek a conditional-use permit for the Chagrin River Road site. Cochran described the existing historic home as “charming, warm and quaint” and said the Land Conservancy plans to use it as its primary forum for interaction with landowners, partners, agencies and other conservation organizations. The property will be available to visitors of Forest Ridge Preserve, and will serve as an amenity for the village and its residents. Conversion and expansion of the existing historic home, the core of which was built in the 1830s as one of the first one-room schoolhouses in the Connecticut Western Reserve. 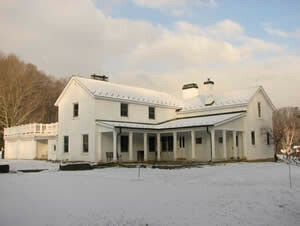 The structure was later converted to a farmhouse and served that purpose for many decades. The historic character of the existing building will be preserved and the addition will blend into the landscape such that the Chagrin River Road views will remain unchanged. The creation of a new park owned and managed by the Village of Moreland Hills. The park, which still needs to be designed by the village, may include a community garden, a fishing pond, birding trails and the use of an existing structure as a new community gathering place. The extension of village-owned Forest Ridge Preserve, which contains nearly two miles of headwater streams within the State Scenic Chagrin River watershed and seven state-listed rare species. This 140-acre preserve will become one of the most important ecosystems in the region. The plans also call for restoration of a cold water stream that is currently culverted and channelized. The Land Conservancy and the village will restore the stream to exceptional cold-water habitat, which is the highest possible stream quality in Ohio.